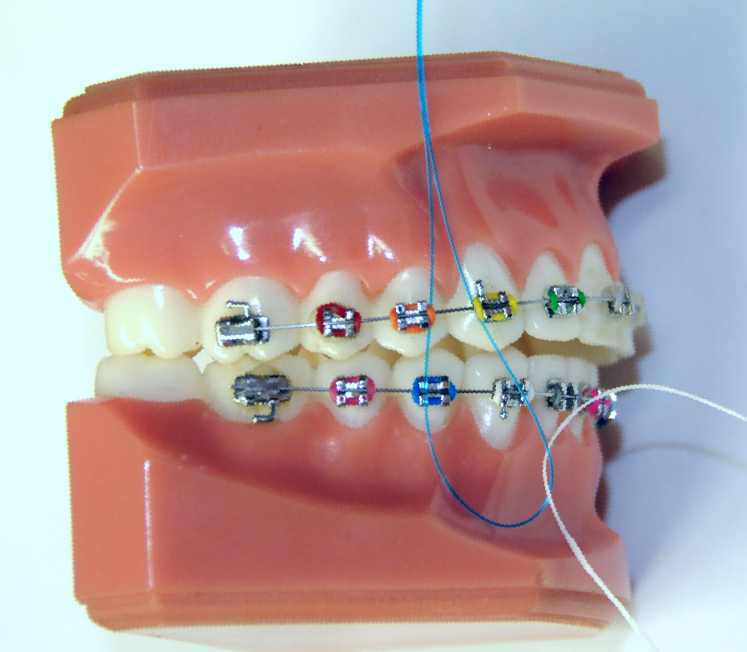 When a patient has braces on their teeth, it is very easy for plaque to accumulate around the wires and brackets. Dr. Thompson recommends that you use an electric toothbrush over a manual toothbrush. Studies have shown that an electric toothbrush reduces plaque 21% more than a manual toothbrush. We like the round brush head by Oral B for cleaning your braces. To loosen the plaque, you have to use the bristles of the toothbrush to do so. Be very organized when brushing. Touch each tooth and also rub your gums with your toothbrush. The main thing with brushing is to move the bristles of your brush up under the wire and around the brackets. Move it under the wire, above and below the wire. After you brush, rinse your mouth out with water to rinse the plaque away. Then, you need to look really close at your teeth and if you see plaque, use your wet toothbrush and dig at it until it’s gone. You need to brush a least three times a day. Finally, your toothbrush will wear out quickly needing to be replaced every two to three months. An electric toothbrush like an Oral B electric toothbrush can make it easier to keep your teeth clean. The Oral B has a round head that rotates back and forth and is good at loosening the plaque. Many patients understand that extra care is needed when brushing and flossing with braces in place. After they think about flossing, they wonder, how do I floss with the wire in the way? The simple fact is you have to get the floss under the wire so you can floss. One of the ways of getting the floss under the wire is with a floss threader. A floss threader is a stiff plastic that has a loop where the floss is placed through. Once the floss threader pulls the floss under the wire, you can then floss. The other way is by using Superfloss. Oral B’s Superfloss are pre-cut floss with a floss threader made on the end of the floss. This is a little easier because you don’t have to place the floss through the loop of the floss threader and hold it in the loop as you pull the threader under the wire. Superfloss is easier for young patients and people who have poor manual dexterity. Both of these items can be found in the dental section of your drug store. Many patients have never been educated in how to floss and why to floss. Between every tooth, a piece of pyramid shaped gum tissue is found. It’s called a gum tissue papilla. There is a space between the gum tissue papilla and surface of the tooth where plaque can hide and grow. This plaque cannot be removed by brushing. You have to floss to dislodge it and rinse it away. Dental plaque lives in our mouth all of our lives and it grows from the sugar we eat. It has to be removed daily or calculus (dead plaque) will form. If this calculus stays against the gum tissue papilla, it will cause gum inflamation, gum disease, bone loss and eventually tooth loss. You should floss every day. If your gums bleed when you are flossing, that indicates that they are not healthy. Continue to floss daily and they will slowly become healthy and not bleed. There is the specific way to floss your teeth. Dentists try to educate the public and here is a sequence on how to floss. 1. Pull out more than 12″ of floss. You want a long piece of floss just in case it gets frayed and you need to move to be better place along the floss. 2. 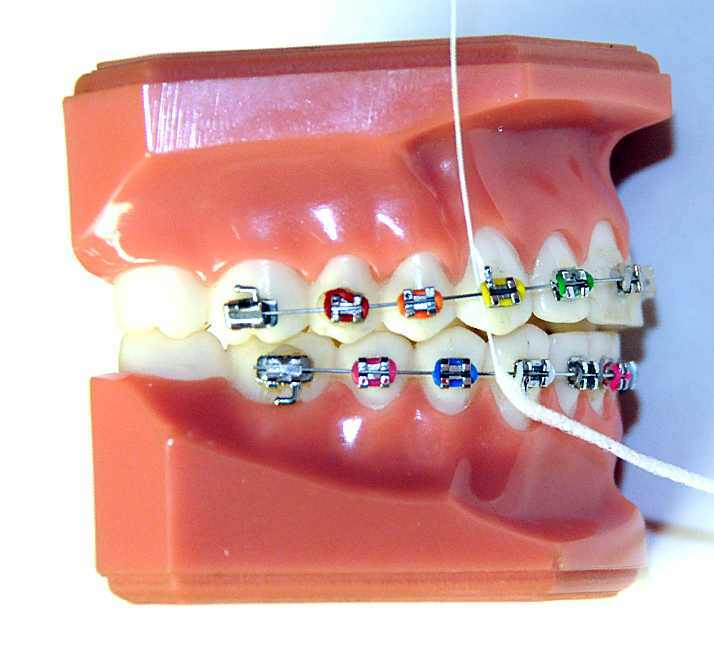 Use a floss threader or super floss to thread the floss under the wire of the braces. 3. Wrap the floss on your middle fingers. You will use your thumb and index finger to move the floss up and down. Do not move the floss side to side between the teeth because you could cut or hurt your gums. 4. Move the floss through the contact point between the teeth. If the floss breaks as you bring it between the contact point, get another piece of floss and bring it through the contact area again. It will usually dislodge the broken piece of floss. 5. Wrap the floss around one tooth of the two teeth. 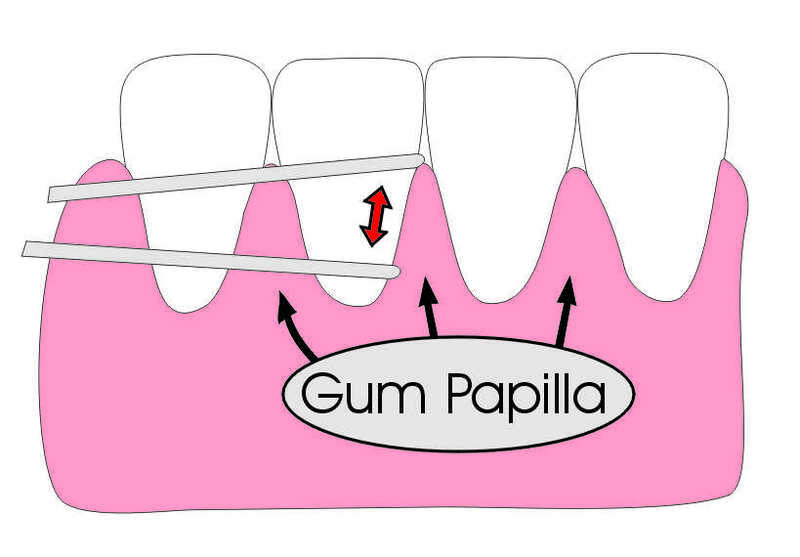 Move the floss up and down and go below the gum tissue papilla. You will notice plaque coming out from between the gum papilla and the tooth. 6. While keeping the floss between the teeth and below the contact, wrap the floss around the other tooth. Proceed to floss on the other side of the gum papilla. 7. Let go of the floss and then with the other hand, pull the floss out from the mouth. 8. Now repeat the process for the next papilla. Make sure that you are systematic and start in one place of the mouth and move from one papilla to the next. When a patient has braces, it takes a lot longer time to floss. Give yourself enough time to do a good job. Flossing is very inportant in reducing the chances of gum disease. Floss daily for healthy gums. ← Which Mouthguards are the Best for Braces?